One great irony of annual reports is that they are usually glossy packages meant to say “look how good we are”, but they are like coffee table books where more people look at the pictures, and few read the fine print. Buried in the Metrolinx Annual Report for 2015-16 are the details of the revenues, costs and subsidies applicable to parts of Metrolinx’ operations. There are specific figures for the UPX and Presto divisions, but not for GO Transit or the administrative/planning side of Metrolinx. In a previous article, I reviewed the subsidies paid for UPX, and now I will turn to the Presto fare card. 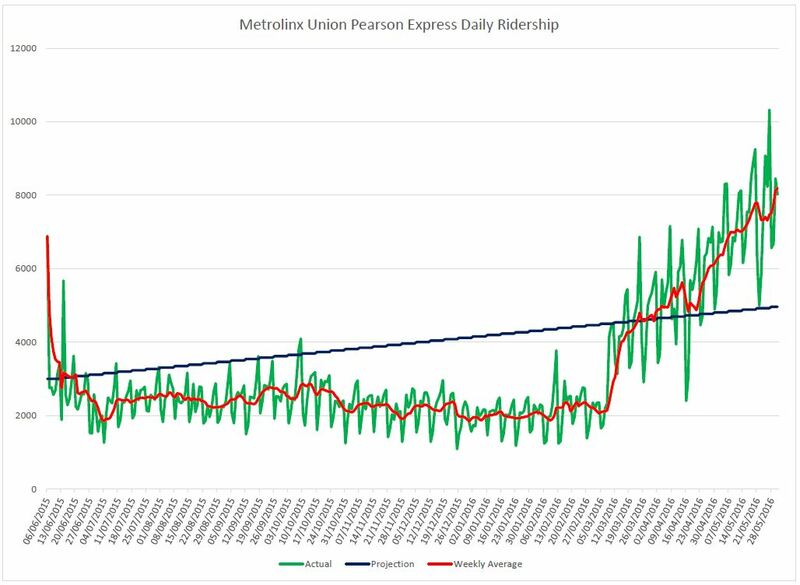 Figuring out just how well Presto is used takes a bit of work because the information appears irregularly in reports to the Metrolinx Board. Here are the relevant excerpts. **Taps refers to the total number of boardings by month for balance transactions, Period Pass transactions, and Transfers. More than 417 million taps and $1.3 billion in fare payments to date including period pass taps. More than 287 million taps* and $1.1 billion in fare payments to date. More than 266 million taps* and $1,032 million in fare payments to date. In the delta from March to June 2015, the tap count changes by 140 million, but the caveat about exclusion of period pass taps disappears. This gives some indication of the proportion of taps that serve pass holders as opposed to single fares. It is clear that the monthly tap count sits somewhere in the 17.5 million range. From the Annual Report, we know the revenue (fees from client agencies plus card sales) as well as the cost of the Presto system. The report is silent about whether there is any inter-divisional payment by GO Transit to cover the cost of Presto transactions in a manner similar to the fees charged to other systems using this fare card. GO Transit’s fare revenue was $464 million, and a 2% charge would amount to $9.3 million, roughly equal to the total fees collected by Presto. As a matter of comparison, the TTC estimates its fare collection costs at 5% of revenues, and that is the basis for the agreement on Presto fees that the TTC will pay. With an average fare of just over $2, the cost per ride of fare collection is about $0.10. Given that the average ride would involve two taps (on average, riders transfer once in their journey), the cost of fares “per tap” would be about $0.05 on the existing TTC system. The way the numbers are presented prevents a clear understanding of Presto’s cost or the degree to which it is subsidized either by GO fare revenue or by general subsidy payments from Queen’s Park. A basic question all transit systems using Presto must ask is for a clear understanding of the relationship between the fees they are charged for fare handling and the actual cost of Presto operations.